A few weeks ago, I saw an article on Facebook that caught my attention. It challenged people to stop reading white, straight, cis male authors for one year. To me, this didn’t sound like a very difficult challenge; it sounded like fun. I was just about to say something to that effect, or at least to “like” the link, when I remembered my promise to myself not to comment on articles I hadn’t first read. Since I had a few minutes, I clicked on it. The author—K. Tempest Bradford—is a writer, blogger, critic and activist who often speaks out on issues that touch upon the intersection of race, gender and sexuality. I found her arguments to be very reasonable. I then noticed that, at the end of the piece, there were three lists of suggestions to get you started—one of women writers, one of writers of colour, and one of writers in translation. I got up to leave for work while quickly skimming the lists to see I had read any of the suggested authors. I sat down with a thud. To my great surprise, I saw my own novel, Cycling to Asylum, on the list of speculative fiction novels written by women. Wow! Was I glad that I bothered to read this article! Later that day, I read the piece more carefully. Unfortunately, I also started scrolling through the comments on the bottom. The article had engendered a huge response—over 2500 comments—and it seemed to me that many of the commenters hadn’t even bothered to read what the writer had to say. 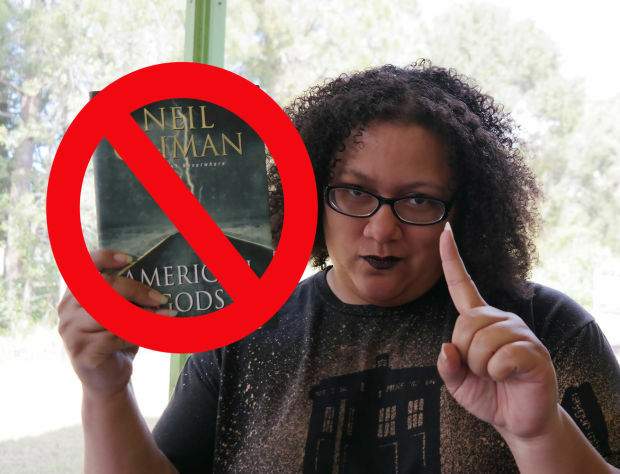 Some of the comments were simply responding to the lead photo—a picture of the author, K. Tempest Bradford, holding a copy Neil Gaiman’s novel, American Gods, a book that I have read. In the photo, the book is circled with a cross-out symbol through it, and Tempest Bradford is wagging her finger. It’s cute and was obviously meant to be tongue-in-cheek. I think this was a brilliant choice on her part—to pick an extremely popular white male author with a reputation for being cool. He was unlikely to feel threatened by her challenge. In fact, Neil Gaiman commented on article, saying that he thought it was great and that he didn’t mind being the “posterbook” for what not to read. Yet, almost all the initial comments were either from people livid at the idea of being asked not to read Neil Gaiman (even for a year) or who were boycotting Neil Gaiman because of being angry with his wife (referring to her by that title and not by her actual name, Amanda Palmer.) How ironic and sad that a discussion about whether to read authors who are not straight, white men for a year is derailed by gossip about a popular white, male author’s wife! I should have stopped reading there, because what followed made me nostalgic for gossip about Amanda Palmer. Vicious, ignorant, ugly—these are just some of the words I would use to describe a large number of the later comments. People called the author of the article a nazi, a racist, and made reference to the Spanish Inquisition. I won’t even mention some of the other comments that demean her in more personal, cruel, and adolescent ways. You would think that she was coming into these people’s homes, burning their books and torturing them until they agreed to read different ones. This is a challenge and a challenge can always be refused. The author even suggests that people adapt the challenge to their own particular needs or desires. For instance, an immigrant like myself could decide to read more Canadian fiction, or to read Québecois literature in the original French. In fact, this challenge has gotten me to think about my own reading habits. It was my father who was my original model—the big reader in the family—so as a kid, I read what he read, which was largely books written by white, Jewish men, or spy novels suggested by the Book-of-the-month club. I enjoyed these books back then, but as an adult, I began concentrating more on science fiction. I loved this genre, but often felt there was something missing. Some Golden Age science fiction seemed almost laughable to me, even when I was young. How can it be that we are flying around the galaxy in spaceships, travelling through time, and making robots with artificial intelligence, yet women are still staying home, getting married, taking their husband’s names, and raising the kids? Why aren’t they in the spaceships? These books did not age well. It aggravated me that a book about the future was so lacking in social imagination that it sounded more like the past. When I discovered Ursula K. Le Guin, I found out what had been missing. I began reading more women authors. I stumbled across Octavia Butler and my world opened still wider. I began reading more writers of colour, men as well as women, and not just speculative fiction. I was enjoying authors from other parts of the world as well, particularly literature from India and Latin America. Around that time, I belonged to a book club. We were mostly women and ended up reading a lot of “Oprah books.” I liked these books well enough at first, but began tiring of them the way you tire of eating too much rich, sweet food. I went back to reading male authors as well as women authors and learned that many of my favourites were queer. The more different types of authors I read–particularly writers from marginalized communities–the more I tended to enjoy the work. This makes sense if you are a person who questions authority and thinks that the world needs to change. It also makes sense if you crave diversity and want to learn about different societies and experiences. The way in which I diversified my reading was not based on a challenge, but rather, was more a natural process. But what if someone came and challenged me to start reading a category of authors I hadn’t read before? Would this make me angry? Defensive? Abusive towards the person making this suggestion? What does it mean that this is the way in which so many peopled have reacted to this challenge? At first, I felt discouraged by the response to the article and to similar reading challenges. I still feel angry and disappointed, but I have also begun to see it in another way. People become defensive when they feel threatened, and they often feel threatened when we’ve reached a tipping point. Maybe the fact that so many people reacted in this way means that they are nervous because things are changing. It does seem to me that the stranglehold that mainstream writers–often male, white and straight–have had on the world is loosening. I will celebrate this hopeful trend by finding a challenge that makes me sweat a little too. To read the original article, go to xojane, a popular women’s online magazine. The article was also republished by Time Magazine under the less controversial title: What I Learned by Adding Diversity to My Reading List.